Store owner Elvis Nunez, 53, demonstrating how he defended himself in a shootout with an armed robber Mach 14, 2014. The robber died. Photo taken March 18. 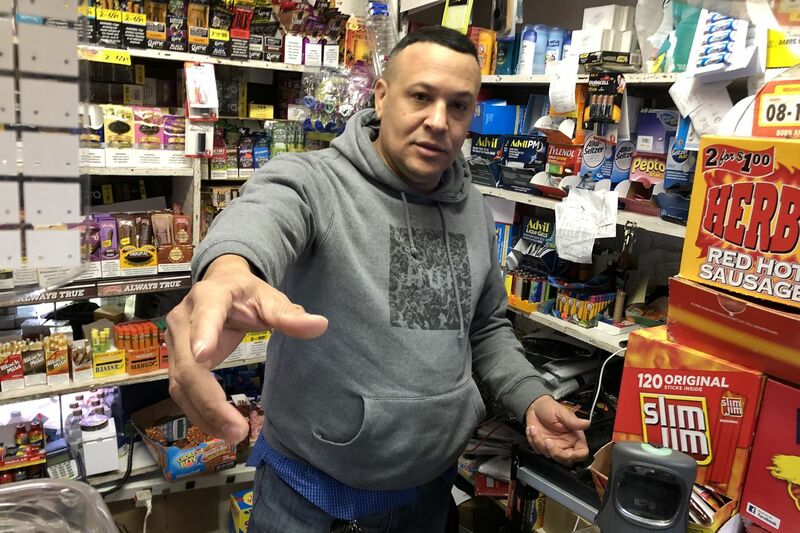 The District Attorney’s Office has ruled that a West Philadelphia grocery store owner was justified last week when he fatally shot a masked would-be robber who had first fired at him, a Police Department spokesperson said Thursday. "The case is cleared as a ‘justifiable killing of a felon',” police said in a statement. Just before 9 p.m. on March 14, McCormick entered the 54 and Wyalusing Food Market brandishing a handgun and wearing a black mask over his face, and fired a shot at store owner Elvis Nuñez. Nuñez, 53, dodged the bullet, pulled out his Glock handgun, and fired once into McCormick’s abdomen, he told The Inquirer this week. The 54th and Wyalusing Food Market, where owner Elvis Nunez shot and killed a robber March 14, 2019. After running from the store, McCormick fired three more shots at Nuñez, who was uninjured. McCormick attempted to drive away but crashed his car a short distance from the store, where police found him, still wearing the mask and with the gun he had fired at the store owner, police said. He died that night at Penn Presbyterian Medical Center. Nuñez, who immigrated from the Dominican Republic in 1993, had been robbed twice before. The father of five said he continues to run his store.